Conventional wisdom has it that genre novels -- Westerns, detective stories, romances and, especially, science fiction -- aren't real literature. They are claimed to offer nothing more than pulp fiction for pulp minds. Conventional wisdom, of course, frequently overlooks the facts. Two of the twentieth century's most influential -- and studied -- novels were science fiction. I refer, of course, to 1984 and Brave New World. 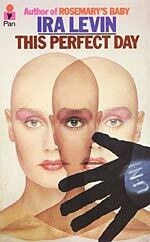 These (along with the under rated This Perfect Day by Ira Levin) are horrifying warnings of collectivist dangers. Science fiction (henceforth termed 'SF') or, as the late master of the genre, Robert A. Heinlein, would prefer, speculative fiction (to which the initials also happily apply) also provides a unique forum to present a promising vision. Of course, the creation of a fictional, alternative -- and recommended -- society is not new. Plato's Republic is one such, while More's Utopia has lent a useful pejorative to the language for many such visions. But the field is not confined to proto-socialist systems. Indeed amongst the most vibrant of 'utopian' visions presented in fiction in recent decades have been precisely the opposite: pure, unregulated capitalist societies. I shall discuss just three -- one by Heinlein and two others by L. Neil Smith. Heinlein's writing spanned a period of 49 years, until his death in 1988. While remaining totally within the genre of SF, he spanned an extraordinary range from his 'juveniles', to a novel oddly influential amongst the hippie generation. (Stranger in a Strange Land, in which Heinlein conjured up a religion to which, incredibly, there are still practising adherents!) I rate his best work, though, to be his 1966 rebellion novel, The Moon is a Harsh Mistress. Imagine an over-populated, over-regulated Earth using the Moon (or Luna, as the satellite is by convention termed in SF) as a prison colony, in the same way as England used Australia and the American colonies. Imagine also that there are ample supplies of water, in the form of ice pockets, contained on the moon (which is suddenly looking like a real possibility following discoveries by NASA just this year). Put the two together and you have, courtesy of plentiful solar power, massive underground grain farming to supplement the food supply of an Earth that is perpetually poised on the edge of famine. Delivery is cheap, since little boost is required to lift the steel-contained grain 'barges' from the Luna's surface, and careful selection of orbits reduces the need for braking prior to splash-down on Earth. Luna, largely populated, by the time of the story, by ex-convicts and their descendants, is governed by an absentee government with no concern at all for the well-being of its inhabitants. Left to their own devices, they have evolved one of the most vibrant, and startling Law-free societies ever to be postulated in print. I say 'Law-free', not 'law-free'. There are no laws imposed from above regulating commerce, nor relationships between people, nor even against crimes. Instead a system of customary law has evolved. Wrongs are righted by the impromptu hiring of a respected person to serve as judge. Social customs (including marriage and sexual practices, which on Luna, due to the low proportion of women as a result of its prison-colony origins, give an unusual amount of power to women and demand of males exceptional courtesy) have evolved in response to existing conditions, including survival in an inhospitable environment. The story is one of revolution, more or less paralleling the American revolution of 1776. The revolution succeeds, at some cost -- not the least of which is the institution of a Luna government, democratic in principle and good-willed in intention, which seems destined to impose unwelcome losses of freedom. This potentially didactic piece is packaged in one of the most concise pieces of prose I have read, and makes a compelling read. Would that all writers could do their job as engagingly as Heinlein. Heinlein was an extraordinarily influential writer, a fact reflected in his appearance as a revered character in at least two other novels. Among those he influenced was David Friedman, son of Milton, who was prompted to develop a theory of anarcho-capitalism which appears in his Machinery of Freedom. Another person Heinlein influenced is the prolific SF writer, L. Neil Smith. From time to time, alternative history novels enjoy mainstream popularity. These novels are based on the premise of a historically significant divergence, leading to a markedly different world. In the case of Robert Harris' Fatherland, the United States failed to involve itself in the Second World War, leading to the time of the story, set in the early 1960s, with Hitler celebrating his 75th birthday. Or there is Newt Gingrich's 1945, in which Germany launches an attack on the United State's Manhattan Project. Usually the point of divergence is substantial, and fairly recent in time. 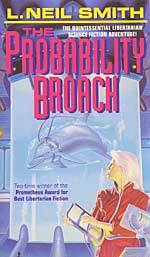 Neil Smith's first novel, The Probability Broach, originally published in 1980, posits a point of divergence that consists of the addition of one word to one document more than two centuries ago, creating as different a world from that in which we live as can be imagined. The single word is 'unanimous'. The document is the United States' Declaration of Independence. Instead of saying 'from the consent of the governed', in Smith's alternative world the Declaration says 'from the unanimous consent of the governed'. This small change sees the subsequent shooting of George Washington for attempting to suppress the Whiskey Rebellion, the withering of the state of the United States, and its State governments, with the Presidency becoming a part-time, honorary office. Economically, the wealth of this 'other' United States is incredible ... and it makes one think. If you conservatively posit that on average Government policies, including taxation, cost half a percent in economic growth each year (and Smith would claim they cost more than that), then over two centuries the gross product would be 2.7 times higher than what it is now. Yes, you can be half-percented to death! The story itself is about a Colorado police officer, Win Bear, who slips into this other world from a pessimistic projection of our own. The technology comes, of course, from the 'other side' which, along with enhanced economic growth has enjoyed accelerated technological development. Bear finds himself in a land without imposed laws, but customs. Everyone carries guns. Everyone is healthy (courtesy of superb medical technology). And property-rights enforcement is carried out by private contractor, of which his alter-ego is one. The details of how such a society would work are conveyed through the learning process of the first (or 'our') Win Bear, without slowing the pace of a snappy tale. Included in the story, unfortunately in my view, are intelligent monkeys and dolphins, but I suspect that Smith introduced these to make a separate point about 'human' rights. On the other hand, the appendix outlining the significant historical events of 'that' America has some rather amusing points, such as '1865: Actor John Wilkes Booth murdered by obscure Illinois lawyer', and the accession of such people as H. L. Mencken and Ayn Rand to the Presidency. A later novel by Smith, his 1996 Pallas, is more conventionally SF, with a utopian, government-free, hunter-gatherer/industrial society established on an asteroid. A pocket of the asteroid has been reserved for a Stalinist 'utopian' enclave. The contrast of utopias is fascinating, as is the release of productive energy by the main protagonist, who escapes from one to the other. Again Smith's humour is evident. Ayn Rand makes an appearance as a character (under a different name) and, of all people, Shirley Maclaine appears, treated with surprising sympathy but in a way that highlights the inherent contradictions of views of the kind that she holds. Smith argues that while the case for freedom -- economic and otherwise -- must continue to be established in an intellectually rigorous way, it needs to be supported by showing how it can work in practice. Smith would be the last to submit his visions as what will actually happen -- and Heinlein consistently denied over the decades any unusual prescience on his own part -- but as the able writers on market economics continue to build the factual case, the spirit of people needs to be filled with the vision of what is possible. These novels, and others of their kind, achieve that.